1. Make the Lemon-Tahini Goddess Dressing: In a food processor, combine the tahini, garlic, lemon juice, nutritional yeast, extra-virgin olive oil, ½ tsp salt and black pepper to taste and process until smooth. Set aside until ready to use. 2. Cook the lentils according to the table below and set aside. 3. Cook the spelt berries according to the table below and set aside. 4. In a large frying pan, heat the olive oil over a medium heat. Add the onion and garlic and sauté for a few minutes, until the onion is translucent. 5. Add the bell pepper and tomato and sauté for 7 to 8 minutes more, until most of the liquid has cooked off. 6. Stir in the spinach and sauté for a few minutes more, until the greens wilt. 7. 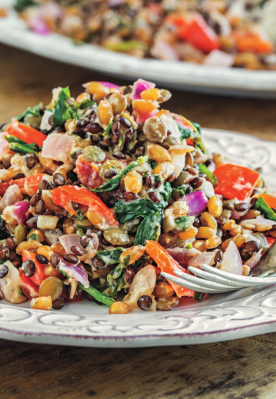 Stir in all of the Lemon-Tahini Goddess Dressing and the cooked lentils and spelt berries. Reduce the heat to low and simmer for a few minutes more. Remove the pan from the heat and stir in the minced parsley. 8. Season with salt and black pepper to taste. Recipe taken from The Oh She Glows Cookbook by Angela Liddon (£16.99, Penguin Random House).